The Supreme Court’s landmark decision upholding the Affordable Care Act was a deft turn by Chief Justice John Roberts Jr., who voted with the court’s four moderate liberals for the first time in a 5-to-4 ruling. Yet, while they upheld the law’s mandate for individuals to buy insurance under Congress’s taxing power, the chief justice joined the four other conservatives to reject that provision under the Constitution’s commerce clause. That rejection underscores the aggressiveness of the majority’s conservatism and marks a stunning departure from the long-established legal consensus that Congress has broad power to regulate the economy. Over the past few months I’ve read a number of optimistic assessments of the prospects for Europe. Oddly, however, none of these assessments argue that Europe’s German-dictated formula of redemption through suffering has any chance of working. Instead, the case for optimism is that failure – in particular, a breakup of the euro – would be a disaster for everyone, including the Germans, and that in the end this prospect will induce European leaders to do whatever it takes to save the situation. I hope this argument is right. But every time I read an article along these lines, I find myself thinking about Norman Angell. Who? Back in 1910 Angell published a famous book titled “The Great Illusion,” arguing that war had become obsolete. Trade and industry, he pointed out, not the exploitation of subject peoples, were the keys to national wealth, so there was nothing to be gained from the vast costs of military conquest. The United States is in the midst of a vicious cycle of inequality and recession: Inequality prolongs the downturn, and the downturn exacerbates inequality. Unfortunately, the austerity agenda advocated by conservatives will make matters worse on both counts. The seriousness of America’s growing problem of inequality was highlighted by Federal Reserve data released this month showing the recession’s devastating effect on the wealth and income of those at the bottom and in the middle. The decline in median wealth, down almost 40 percent in just three years, wiped out two decades of wealth accumulation for most Americans. If the average American had actually shared in the country’s seeming prosperity the past two decades, his wealth, instead of stagnating, would have increased by some three-fourths. In some ways the data confirmed what was already known, but the numbers still shocked. We knew that house prices – the principal source of saving for most Americans – had declined precipitously and that trillions of dollars in home equity had been wiped out. But unless we understand the link between inequality and economic performance, we risk pursuing policies that will worsen both. What is it about the political rightwing in the Lone Star State? It seems like they are now competing with Arizona to take the lead as the nation’s most anti-education and anti-intellectual state. Where does this Republican fear of critical thinking come from? One would have to surmise it may be derived from two sources: Either (1) they learned some nifty reactionary ideas from the Arizona struggle against HB2281, the law banning the teaching of Chicana/o Studies in public schools, or (2) they understand that Texas public schools are now filled with a majority of minority [sic] students, most of them Mexican-origin, and it may not be a good idea to encourage them to become anything other than servants of the 1% by denying them anything but rote learning and vocational educations. Roger Bybee: Dems Paint Romney as “Outsourcer-In-Chief,” But Will Obama’s Trade Deal Blow It? The Obama administration and Democrats have been busily puncturing Mitt Romney’s record as an experienced “job creator,” with a multi-pronged attack on Romney’s role as a “pioneer” in offshoring jobs while heading up the private-equity fund Bain Capital. Backed up by an ever-mounting supply of evidence from the New York Times, Boston Globe, and the Washington Post, Obama and the Democrats have shredded Rommey’s arguments that he is the man to restore employment. Yet recent leaks reveal that the Obama administration has been secretly negotiating with Pacific Rim nations the Trans-Pacific Partnership (TPP) trade deal, based on the job-destroying NAFTA model. Obama-as with his trade deals last year with South Korea, Panama, and human-rights pariah Colombia-is once more falling into line behind CEOs in promoting what he as a candidate fiercely denounced in 2008 as “trade deals like NAFTA and China [that] have been signed with plenty of protections for corporations and their profits, but none for our environment or our workers who’ve seen factories shut their doors and millions of jobs disappear. It is the midpoint of a common year. This is because there are 182 days before and 182 days after (median of the year) in common years, and 183 before and 182 after in leap years. The exact time in the middle of the year is at noon, or 12:00. In the UK and other countries that use “Summer Time” the actual exact time of the mid point in a common year is at (1.00 pm) 13:00 this is when 182 days and 12 hours have elapsed and there are 182 days and 12 hours remaining. This is due to Summer Time having advanced the time by one hour. It falls on the same day of the week as New Year’s Day in common years. The Civil Rights Act of 1964 (Pub.L. 88-352, 78 Stat. 241, enacted July 2, 1964) was a landmark piece of legislation in the United States that outlawed major forms of discrimination against blacks and women, including racial segregation. It ended unequal application of voter registration requirements and racial segregation in schools, at the workplace and by facilities that served the general public (“public accommodations”). Powers given to enforce the act were initially weak, but were supplemented during later years. Congress asserted its authority to legislate under several different parts of the United States Constitution, principally its power to regulate interstate commerce under Article One (section 8), its duty to guarantee all citizens equal protection of the laws under the Fourteenth Amendment and its duty to protect voting rights under the Fifteenth Amendment. Well, if you’re rooting for one of the 135 riders that are now more than a minute down you have my official permission to panic. Given the tight bunching and mass timing during the flatter stages it will be hard to make that up. This one is Kansas flat. You may think Menchov and Gilbert put on moves yesterday, but what happened is that Lancaster and Gretsch fell back. Now there’s always the possibility of flaming chunks of twisted metal to keep you amused as well as the spectacular scenery. One category 4 climb and a point award. It should be routine and restful except that it’s rare for there not to be some early breakdowns. Sprinters will be featured and everyone will be looking at Cavendish for a good finish. Coverage is customarily on Vs. (NBC Sports) starting at 8 am with repeats at noon, 8, and midnight. There will be some streaming evidently, but not all of it is free. This time of year I generally write about fireworks since they are integral to the celebration of Independence Day. I have written some rather technical pieces in the past, so this time I thought that it might be a good idea to write about some safety factors that users of consumer fireworks should observe. Even though consumer fireworks are designed to minimize risk of injury, there is a finite probability that accidents and injuries will occur. Many of you know how much I enjoy the music of The Who, and I shall work them into this piece. It happens to involve one of the most treacherous pyrotechnic composition, flash powder. In a former life, I was a professional pyrotechnician, and I am still scared of flash powder. Many accidents involving consumer fireworks are either personal injuries caused by negligence (often alcohol fueled), ignorance, or bravado (also often alcohol fueled). Many other accidents involving these products have to do with unintentional fires cause by firework use, storage, or transport. 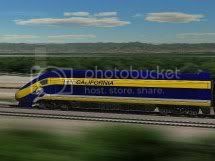 Sunday Train: Is State Sen. Simitian aiming to kill High Speed Rail in California? This coming week is supposed to contain an important symbolic Independence Day: the day when the California State Senate votes whether or not to proceed with one strategic element of Energy Independent Transport for the State of California, or whether to gamble the state’s future on petroleum. It is, of course, a very sure thing as a gamble ~ on the losing side. They aren’t making more, and the butane from natural gas liquids and energy inefficient production of ethanol from corn starch that has been used to juke the states on US “liquid fuel production” doesn’t change the fact that we still depend on petroleum imports for over half of our petroleum consumption. We deplete more and more low production cost petroleum every year, shifting our consumption to higher cost petroleum. And even if we had the petroleum that Pollyannas would like to wish into existence, we can’t afford to burn it all at an accelerating rate, due to the CO2 emissions that will result. State Senator Simitian does not seem to see it that way, as he appears set to vote kill the effort to allow the California High Speed Rail project to break ground next year. Now, in an wonderful display of political pretzel logic, State Senator Simitian threatens to kill the HSR project will declaring his strong support of it: it will all be someone else’s fault if he votes to refuse to break ground next year.